In stroke play, as a player approaches their ball the wind blows their cap off. It falls to the ground causing their ball to move a few inches nearer to the hole. What is the ruling? a) There is no penalty and the ball must be played from where it comes to rest. b) There is no penalty and the ball must be replaced. c) There is a penalty of one stroke and the ball must be played from where it comes to rest. d) There is a penalty of one stroke and the ball must be replaced. 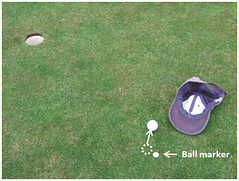 e) There is a penalty of two strokes and the ball must be played from where it comes to rest. f) There is a penalty of two strokes and the ball must be replaced. d) There is a penalty of one stroke and the ball must be replaced. Rule 18-2a(ii). 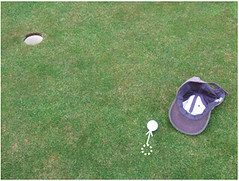 The same circumstances as in Question 1 but the player had replaced their ball at their ball-marker and the marker was still in place after the ball was moved. What is the ruling? a) There is no penalty and the ball must be replaced at the marker. b) There is a penalty of one stroke and the ball must be replaced at the marker. Note: Under Rule 20-4, a ball is in play when it is replaced, whether or not the object used to mark its position has been removed.